154 Beacon is located on the north side of Beacon, between Berkeley and Clarendon, with 150 Beacon to the east and 160 Beacon to the west. 154 Beacon was designed by architect Charles K. Kirby and built in 1861 as the home of Peleg Whitman Chandler and his wife, Martha Ann (Cleaveland) Chandler. They previously lived at 99 Mt. Vernon. Peleg Chandler bought the land for 154 Beacon on December 16, 1859, from attorney George P. Sanger, who had acquired it one week before from the Boston and Roxbury Mill Corporation. Click here for an index to the deeds for 154 Beacon. In his Houses of Boston’s Back Bay, Bainbridge Bunting describes 154 Beacon as “one of the most ingeniously symmetrical and handsome Academic facades in the district…a broad flight of stairs leads to the gracefully cantilevered entrance balcony…the attic was recessed behind the parapet.” The parapet referred to by Bunting was not original, but rather was added when the original mansard-roofed top story was replaced in 1935. Bunting does not attribute 154 Beacon to a particular architect. However, a May 25, 1861, party wall agreement between Charles Kirby (who designed and built 156-158 Beacon) and Peleg Chandler establishes that he was the architect of 154 Beacon, stating “…the said Kirby has erected a house on his lot and has placed one half of the division wall (namely six inches) on the land of said Chandler … and said Chandler is now erecting a house and stable on his lot under the direction of said Kirby as architect…”. 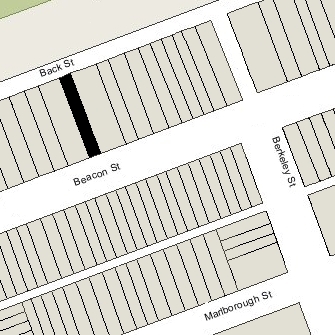 The stable referenced in the agreement was built behind 154 Beacon, but was replaced sometime in the late 1890s: it is shown as a stable on the Bromley maps for 1895 and before, but as an ell extending to Back Street on the 1898 and later maps. Peleg Chandler was an attorney and publisher of the Law Reporter, which he established in 1838. He authored numerous legal and historical publications, including American Criminal Trials and a biography of Massachusetts Governor John Albion Andrew. The Chandlers’ unmarried children, Parker Cleaveland Chandler and Ellen Maria Chandler, lived with them. Their other son, Horace Parker Chandler, moved to Chicago after graduating from Harvard in 1864 and entered the publishing business. He later returned to Boston and was a real estate and mortgage broker; he and his wife, Grace Webster (Mitchell) Chandler, lived in Jamaica Plain. Martha Chandler died in 1881. Peleg Chandler continued to live at 154 Beacon with Parker and Ellen Chandler. Parker Chandler, a lawyer, continued to live there until about 1884, when he moved to 54 Temple. Peleg Chandler died in May of 1889. Ellen Chandler continued to live at 154 Beacon during the 1889-1890 winter season, but moved thereafter to 302 Beacon. On June 28, 1890, 154 Beacon was acquired from Ellen, Horace, and Parker Chandler by Mary (Hasbrouck) Sutton, widow of General Eben Sutton, her son, Eben Sutton, Jr., and her daughter, Eliza (Lila) (Sutton) Young, widow of Harvard professor Ernest Young, who had died in March of 1888. They previously had lived in North Andover, where the Sutton family owned textile mills and they continued to maintain a home. Mary Sutton and her children lived at 154 Beacon during the 1890-1891 winter season, but had moved by the next season. Eben Sutton, Jr., married in November of 1891 to Anna Boyd McAtee; after their marriage, they lived at the Hotel Vendôme and then in Baltimore. 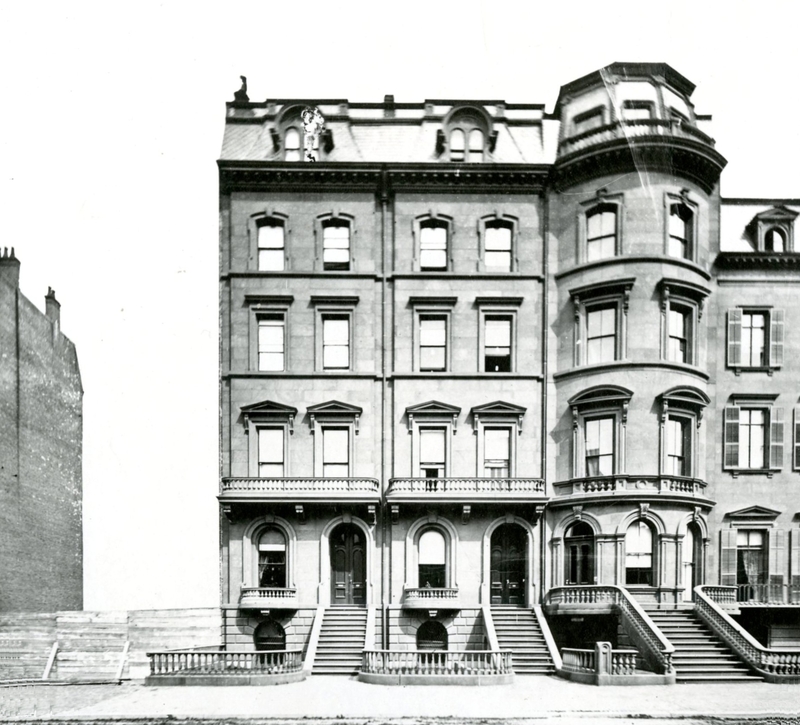 By the 1892-1893 season, Mary Sutton and Eliza Young were living at 501 Beacon. On May 15, 1891, 154 Beacon was acquired from Mary Sutton, Eben Sutton, and Eliza Young by Mary Waldo (Lincoln) Davis, the wife of Joseph Estabrook Davis. They previously had lived in Worcester. Joseph Davis was a retired manufacturer of railroad supplies and a director of the Worcester and Providence Railroad. He died in October of 1906. Mary Davis continued to live at 154 Beacon during the 1912-1913 winter season, but moved to 113 Marlborough soon thereafter. On August 1, 1913, 154 Beacon was acquired by Dr. Octavius Thorndike Howe. He and his wife, Elizabeth (Plummer) Howe, made it their home. They previously had lived at the Hotel Somerset. They also maintained a home at Bass Rocks in Gloucester. Octavius Howe was a retired physician. He was president of the American Wheel Company and the author of several books on Massachusetts history. By the 1913-1914 winter season, the Howes had been joined by their son and daughter-in-law, Dr. George Plummer Howe and Marion Dudley (Endicott) Howe. They previously had lived in an apartment at 384 Commonwealth. George Howe was a physician and maintained his office at 29 Gloucester. Interested in anthropology and archeology, in 1906-1907 he had served as surgeon with Ernest Leffingwell’s expedition to northern Alaska. George and Marian Howe were first cousins: Marian Howe’s mother, Mary Hubbard (Howe) Endicott, was the sister of Octavius Thorndike Howe. In July of 1914, Octavius Thorndike applied for (and subsequently received) permission to construct a garage at the rear of the property. Elizabeth Howe died in June of 1915 and George Howe was killed in action in Belgium in September of 1917. Marian Howe continued to live at 154 Beacon with Octavius Howe during the 1917-1918 winter season, but moved soon thereafter and by 1920 was living in Colorado Springs with her mother, Mary (Howe) Endicott, the widow of Henry Endicott, and sister, Augusta Rantoul Endicott. By the 1919-1920-1920 winter season, Octavius Howe had been joined at 154 Beacon by his son and daughter-in-law, Thorndike Dudley Howe and Ann Sturm (Rotan) Howe. Thorndike Howe was a manufacturer of ladies shoe soles. By 1922, they had moved to 29 Brimmer. In November of 1920, Octavius Howe married again, to Lotta P. Kelley. They continued to live at 154 Beacon and maintain a home at Bass Rocks. In September of 1921, he applied for (and subsequently received) permission to expand the garage at the rear of the property by extending it further to the south, filling a portion of the rear yard between the house and the existing garage. Plans for the extension are included in the City of Boston Blueprints Collection in the Boston Public Library’s Arts Department (reference BIN G-37). Octavius Howe died in December of 1931. Lotta Howe moved soon thereafter. 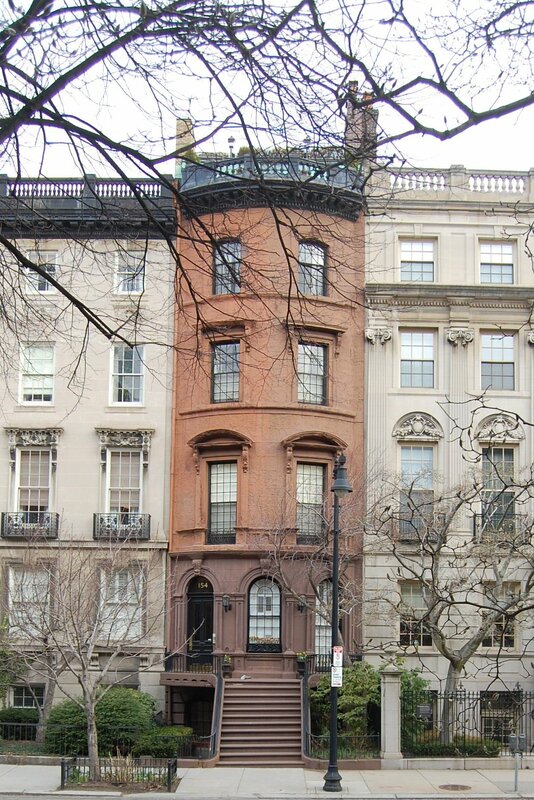 154 Beacon was inherited by Thorndike Howe. Thorndike and Ann (Rotan) Howe lived at 77 Revere. 154 Beacon was not listed in the 1933-1935 Blue Books, and was shown as vacant in the 1932-1935 City Directories. In February of 1933, Octavius Howe’s estate applied for (and received) permission to convert the house into a two-family dwelling, with one unit on the top two floors and the other on the ground and first through third floors. Floor plans for the remodeling, designed by architect Allen W. Jackson, are included in the City of Boston Blueprints Collection in the Boston Public Library’s Arts Department (reference BIN P-108). Thorndike Howe died in September of 1934, a suicide. On March 18, 1935, 154 Beacon was acquired from Thorndike Howe’s estate by Samuel Arthur Block. He previously had lived in an apartment at 50 Commonwealth. In June of 1935, he filed for (and subsequently received) permission to remodel the house back into a single-family dwelling. The remodeling was designed by the architectural firm of Krokyn and Browne. As part of the remodeling, the original mansard was removed and the top floor modified and recessed behind a parapet. Samuel Block was vice-president and controller of the U. S. Smelting, Refining & Mining Co. He was unmarried. After immigrating from Russia as a child, he had been a newsboy in the West End and was active in the boys club that met at the West End House. As an adult and successful businessman, he served as president of the West End House. 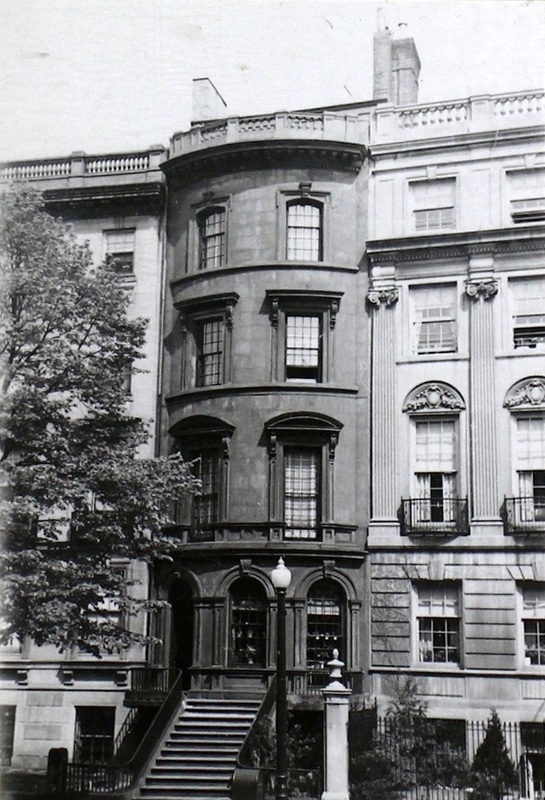 The West End House (which later became the Boys and Girls Club) was founded by James J. Storrow based on a concept developed by Mitchell Freiman, a young lawyer who became its first superintendent. Mitchell Freiman died at the age of 38 in 1918, leaving four small children. By 1936, Samuel Block had been joined at 154 Beacon by one of those children, Carl Nathaniel Freeman (Freiman), who also was an accountant with the U. S. Smelting, Refining, & Mining Company. He previously had lived at 115 Newbury. Carl Freeman married in 1955 to Carolyn Ingalls Shaw, a bacteriologist, and they moved to an apartment at 295 Beacon. He died in October of 1963. At the time of his death, he and his wife were living in an apartment at 299 Beacon. Samuel Block continued to live at 154 Beacon until his death in August of 1965. In his will, he left 154 Beacon to Carolyn Freeman, widow of “my late friend” Carl Freeman. By 1966 154 Beacon had become Carolyn Freeman’s home. She continued to lived there in 1968. On November 15, 1968, 154 Beacon was acquired from Carolyn Freeman by Daniel J. Finn, Joseph M. Krol, William E. Sayers, and Francis B. Sellew, general partners in the One Fifty Four Beacon Street Associates LP. On August 1, 1969, the property was acquired the One Fifty Four Beacon Street Associates LP by the Unitrust Corporation, of which Daniel Finn was the treasurer. In May of 1969, it applied for (and subsequently received) permission to convert the house into five apartments. The property subsequently changed hands and on August 15, 1977, was purchased by Donald Lorden DeMore and his wife, Paula B. DeMore. 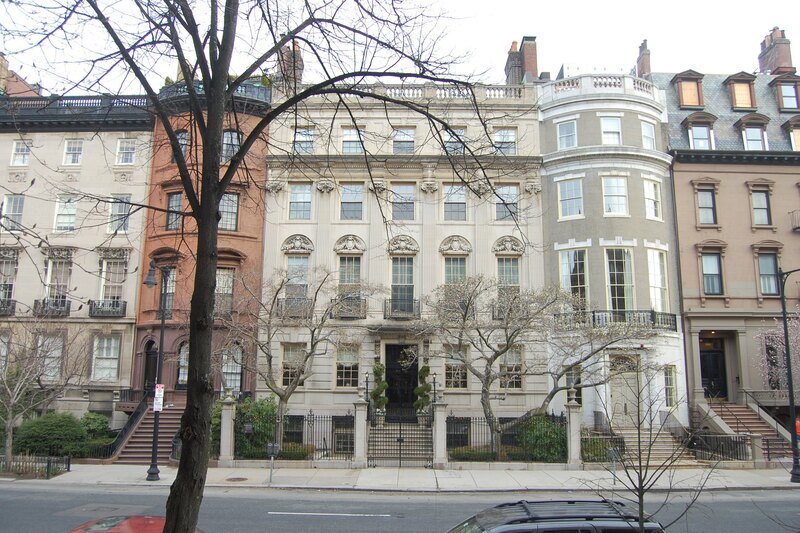 On October 26, 1977, the DeMores converted the property into five condominium units, the 154 Beacon Street Condominium..